A new rugged Bluetooth speaker has launched from a company called Divoom. The speaker is the Voombox-Outdoor and it is designed to provide high quality sound while being able to survive the elements. The portable speaker has a water resistant case that also protects form dust. The speaker promises advanced audio performance for a full range listening experience and a battery that is good for 12 hours of use per charge. The wireless speaker connects to the smartphone or other device using Bluetooth 4.0. The Voombox-Outdoor can also be used as a speakerphone. An integrated mic lets you take calls while on the go without having to put the phone to your ear. The portable speaker measures 185 x 60 x 78mm. The speaker has a pair of 2-inch drivers with 7.5W of power each. The signal to noise ratio is around 75dB and the battery has a capacity of 3200 mAh. It takes about four hours to completely charge the battery. The wireless range is up to 10 meters and the device supports up to 15 hours of talk when used as a speaker phone. 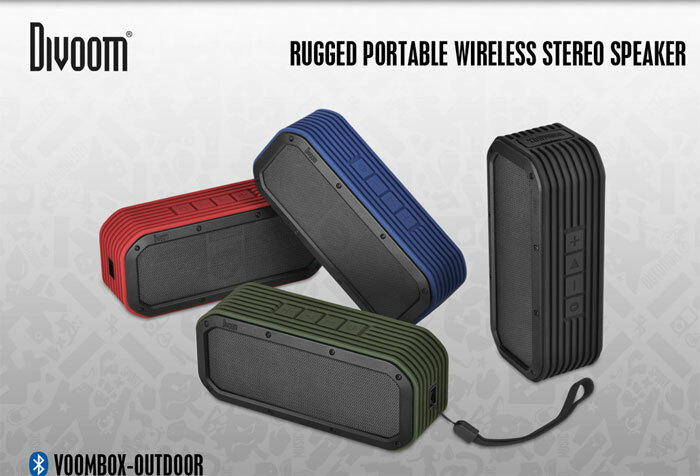 The Voombox-Outdoor is available in blue, green, red, or black colors.